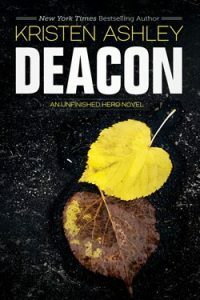 Another awesome installment in the Unfinished Hero series. Raiden Miller is the town of Willow’s local hero. An ex-marine with the medal to prove his hero status, he comes home, shrouded in mystery. It takes a while but, eventually, Hanna catches his eye.But after all these years of Raid and Hanna living in the same town, the question is, why? Is Raid interested in Hanna because she’s sweet and cute? Or does Raid have something else going on? I was in a book funk, reading through books that were solid enough, but I that struggled with due to one aspect or another. But the second I read the first page of Raid, I snapped back to life and immersed myself in all the goodness that is a Kristen Ashley novel. As one of my favorite authors, she never disappoints, and I easily fall for her raw, from-the-heart, melodic manner of speaking, her flawed but big-hearted characters, her captivating stories about the healing power of love. 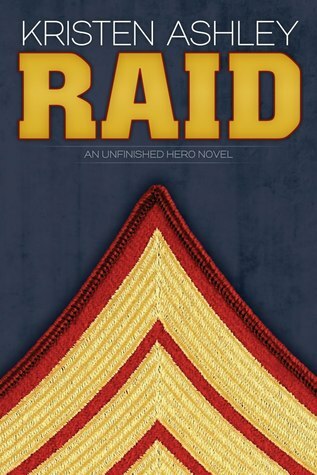 Raid’s story is one of a man who was indeed a hero, but one who suffers from a past marred by loss and a whole lot of ugliness that can’t be unseen. But for Hanna Boudreaux, Raiden Miller was everything she’d ever wanted. He was her forever crush. The boy… the man she pined for secretly… and the man who never took notice of her despite her best efforts. Hanna lived a quiet life in the small town of Willow, Colorado. She was always heads down knitting an afghan, or reading a book if her head wasn’t up, her eyes gazing at Raid, whom she had crushed on even as a six-year-old girl. He never noticed her then and when he returned, a broken ex-Marine hailed as a hero, he didn’t notice her then either. He came back tougher, bigger, more mysterious. But when the reality sinks in that he never will take notice of her, sweet Hanna decides to widen her up-until-then narrow life and take the world on with the zest and vivacity it deserved. And then one day he noticed her. The last thing Hanna expected was for Raid to suddenly be into her. His beautiful face widening into a smirky smile when she was in his presence, which was usually fumbling or stumbling over her words. I love the juxtaposition of both characters. Hanna was so goofy, kind and sweet, while Raid was a tower of corded muscle… a badass, chin-lifting, aviator-glasses-wearing ex-Marine who demanded attention every time he entered a room. And once they are finally together, the chemistry sizzled deliciously. But just as everything seems to be going wonderfully well, Hanna discovers a truth that shatters her and she’s once again determined to leave Raid in her past. Raid never expected to find someone like Hanna. Someone that was so perfect for him. Someone that could make him process and let go of all the demons he buried deep inside… The memories of what he saw and whom he lost… The danger within him always just beneath the surface. She had the power to heal him and give him a hope for the future he never imagined for himself. Raid and Hanna have so much to work through to build a future together. I love that Hanna is sweet, but she’s tough too. Willing to wade through anything to help her man in the way he needs. Willing to put herself at risk for the reward of a happily ever after. I loved how much Raid loved Hanna… how once he found her, he wasn’t about to let go. Ever. It was this beautiful thing to witness. You could feel that she was everything to him. And for Hanna, it was a childhood dream come true, better and brighter than she’d imagined. This is a wonderful story about love and healing and it filled my heart with joy as these two people found so much in each other. It’s also raw and gritty, with an edge of danger as the team of badasses reunite for a situation that calls for retribution. We also get to meet Deacon, another badass bounty hunter with a frightening mask of indifference and I felt a chilling anticipation at getting to discover his story. Once again you experience it all in perfect balance–sexiness, suspense, angst and emotion. I loved Raid and Hanna’s story and can’t wait for more! Click on each of these images to purchase from Amazon U.S.